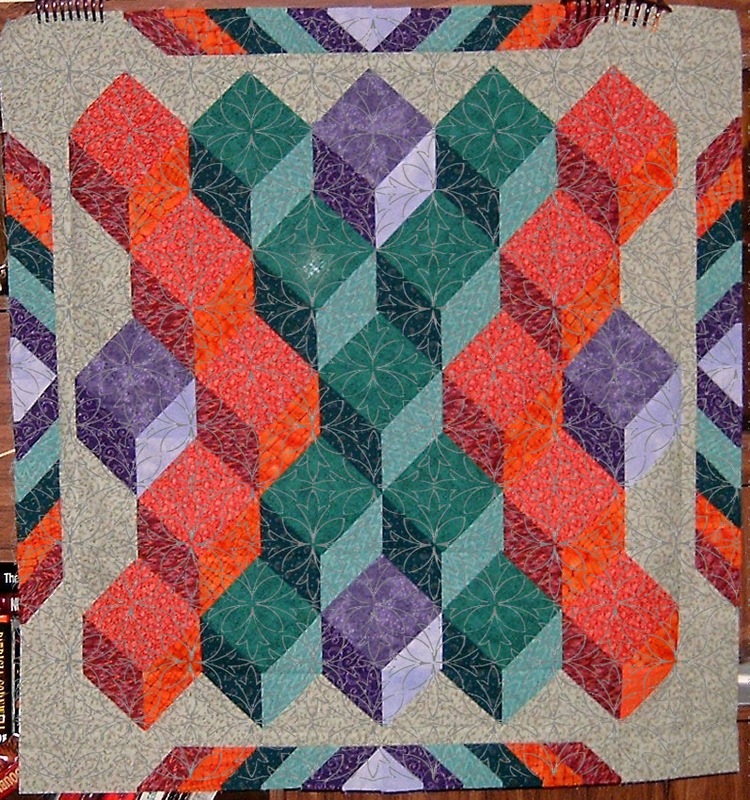 It was with some trepidation, that I started to quilt on the Square Deal Mystery .. Considering what happened with my Hopscotch quilt! I must have quilted the snot out of a scrap piece of batting and backing to make sure that my stitches were going to be okay .. I did the first row across the top, then got the next pass done on the next row then stopped and started to shred the tissue. I know this isn’t the best pic .. nite time and a flash, but hopefully you can see well enough that my stitches are all nicely uniform AND evenly spaced – just how I like them. I’m a wee bit shaky for the first bit, then I got into my groove and it feels right and good! I’m using the thread that I grabbed for $1 a spool at fabricland for this and i really do like the way it looks on this one block ..
I’ve also managed to place this so that the ‘flower’ part of the motif is landing on the top of the blocks .. This is the 2 oz batt that I got on sale at Joann’s back a bit and I just love it! Has a nice heft to it, just enough definition so your quilting isn’t flat. AND my machine likes this weight! Oh and notice how you can’t see thru this one! This is going to quilt up pretty quickly too ..I got a quite a bit done in about an hour or so .. and that included picking off the tissue on the first block! I am feeling confident again! Stitching is good front and back! It’s going smoothly and is going to look just GREAT when I get it done .. I am going to have to hand sew on the sleeve hanger tho .. 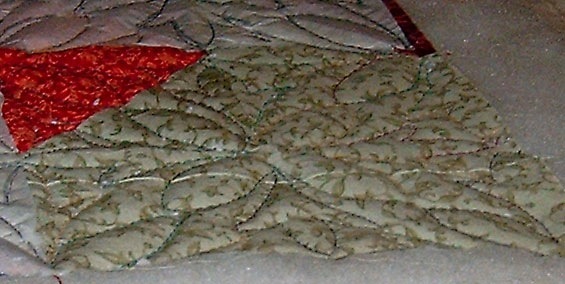 I had planned this quilt edge to edge and well my trick of using the border quilting to secure it, isn’t going to work of course. Oh I just realized that I hadn’t posted my mock up of the quilting on this quilt .. Since the photo isn’t quite straight, you’ll not see the exact lining up of the motifs on the blocks – but you get the general idea. Hooooo-EE! 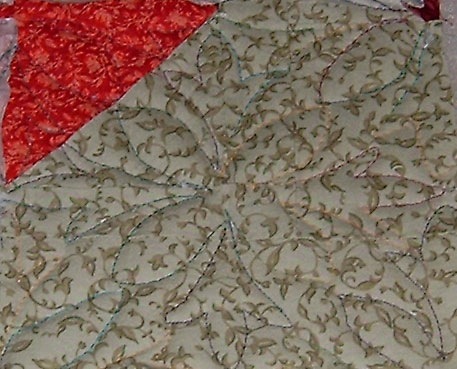 The quilting looks grand, and it’s wonderful to hear that you’re having fun with this one! Guess you’ll be saving up those coupons to get some more of this weight batting, eh?